In the first half of the early 1900’s the following School Districts: the Alhambra Valley School District, the Briones Valley School District, and the Franklin Canyon School District all folded into the existing Martinez Elementary School District. By the early 1960’s only three districts remained in the Martinez area: the Martinez Elementary District, the Vine Hill Elementary District and the Alhambra Union High School District. These districts each had their own board of education, superintendent, and staffs working independently. Then in the prior years to the unification the Martinez Elementary School and Alhambra Union High School Districts operated separately but sharing the same Board Members and Superintendent. Alhambra Union High School District Trustee Dr. B. Otis Cobb, announced that the State Legislature has stated that “Some degree of unification” of school districts whereby “every elementary school will be attached, so to speak, in the nest of some high school district” will “ be coming, whether anyone wants it or not”, in about the next two years. Reporting on a recent meeting of the Contra Costa County District Organization Committee, of which he is a member, Dr. Cobb told trustees of the Alhambra High and Martinez Elementary districts that he felt “certain” the committee’s recommendation will be for combination of the Vine Hill and Martinez Elementary districts with Alhambra High School District into one district. Dr. Cobb declared it was an “absolute fact” that every elementary school will be attached to an existing high school district. The proposal for formation of a unified school district consisting of the Alhambra Union High, Martinez Elementary and Vine Hill School districts, was unanimously approved by the augmented County Committee on School District Organization at their meeting on February 28, 1962. This group consists of the regular county committee, which deliberates on possible unification of district in the county, and representatives of the three local districts. Approval of both units was required to set the unification plan in motion. Next steps in the procedure will be preparation by county school Superintendent Floyd I. Marchus’ office of essential documents, clearance with the board of supervisors and the county district attorney’s office, and approval by the State. Later will come a suggested unified district tax rate, to be arrived at by the committee. If the entire “package” is then approved by the State Board of Education, the unification proposal will be submitted to the voters of the three school districts Nov. 6. If okayed in each district by a majority of the votes, the unified district will come into being July 1, 1963. Name of the new district probably would be Alhambra Unified School District. Voters’ approval would also include election of a five-man Board of trustees. One of the trustees would be from the Vine Hill District. The other four would be from the present Martinez Elementary District (Mt. View, Alhambra Valley and Martinez proper), at large. Election of all five would be by voters throughout the proposed district. There would be one superintendent for the unified district. Present at the meeting were representatives of the three local boards – Lester Small, Alhambra; Fred Ernest, Martinez and August Viale, Vine Hill – and seven of the 11 members of the county committee. The seven of the latter unit were Jack Shahbazian, chairman; Frank Brady, Charlotte Grote, William Leath, George Jeffries, Margaret Plummer of Martinez, and Robert Reed. Proposed merger of Alhambra Union High, Martinez Elementary and Vine Hill Elementary School Districts into an “Alhambra Unified School District” will receive attention from three agencies. The County Boundary Commission will consider acceptability of boundaries for the proposed unified school district. Proponent is County School Superintendent Floyd Marchus. Whenever time is available during the day-long meeting of the Contra Costa Board of Supervisors a letter from Marchus regarding unification will be read. Marchus points out that the proposed merger, encompassing all the territory now in the Alhambra Union High School District, has been processed through the legal steps necessary for submission to the State Board of Education and that an election on the matter is anticipated for next fall. The unification plan also will be discussed tonight at the regular meeting of Martinez public schools Boards of Education, consisting of Alhambra High and Martinez Elementary district trustees in the district’s Administration Building at 921 Susana Street. Possible formation of an “Alhambra Unified School District” resulted last night in postponement of the previously scheduled June 5 tax rate limit election in the Alhambra High and Martinez Elementary Districts. Alhambra-Martinez trustees also favored a joint meeting with the Vine Hill School District board next Tuesday night to lay the groundwork for next steps in proposed merger of the three districts. Alhambra-Martinez Superintendent Thomas R. Turner, after contacting Vine Hill Superintendent David N. Delehanty, announced that the Vine Hill board was agreeable to the get-together and that the joint session was set for March 20th at Las Juntas School, 4105 Pacheco Boulevard. In delaying the tax rate limit election, the Alhambra-Martinez trustees agreed to use the permissive “override” taxes in the amount of approximately 15-cent rate in each of the two districts for adequate operation of the schools during the 1962-63 school year. To be discussed by the three boards on March 20th is the general subject of unification, including possible tax rate for a unified district and whether the recently formed Alhambra-Martinez citizens’ tax rate committee should be enlarged to include citizens specifically representing the Vine Hill Elementary District. Both Martinez Elementary District (which includes Martinez proper, Mt. View and Alhambra Valley) and Vine Hill District are in the present Alhambra Union High School District. If approved by the State Board of Education, the unification proposal is expected to be submitted to the voters at an election next November. If approved by a majority of the voters in each of the three present districts, the unified district would come into being July 1, 1963. Next step in the involved process of preparation for possible unification of the Alhambra High, Martinez Elementary and Vine Hill School Districts will be a meeting of the augmented Contra Costa County Committee on School District Organization at which discussion will concentrate on what tax rate to recommend for the proposed unified district. At a study session of representatives of the three district boards last night, a $4.25-$4.50 tax rate per $100 assessed valuation was suggested, but no decision was reached. Formal action must be by the augmented committee, since proposed tax rate will be on the ballot at the unification election, planned for November 6. At a May 1st meeting it was agreed that in the event of unification, bonded indebtedness of the original districts would be assumed by the corresponding portions of the unified district and that other indebtedness would be assumed by the entire unified district. Alhambra-Martinez Superintendent Thomas R. Turner and Vine Hill Superintendent David N. Delehanty outlined organization and program of a unified district and presented estimates of cost of operation. If the State Board of Education approves the timetable details next month, an election will be held Nov. 6 to decide whether the Martinez Elementary, Alhambra High and Vine Hill Elementary Districts will merge into a unified school district run by five trustees elected at large, with a tax rate of $4.50 per $100 assessed valuation. The Martinez and Alhambra districts “should be represented” at the June 13-14-15 meeting of the state board in Sacramento, Superintendent Thomas R. Turner told trustees Tuesday night. He said that H. Frank Bradford, consultant for the county schools superintendent to the augmented County Committee on School District Organization, would be at the Sacramento session. Turner said that by the next regular meeting of the Martinez-Alhambra trustees June 12, exact date and time of the state board’s consideration of the matter during its three-day session should be known. The augmented County Committee on School District Organization consists of the regular county committee which deliberates on possible unification in the county and representatives of the three local-area districts. Turner explained that a resolution by the augmented group, approved by the county district attorney’s office will be on the agenda of the State Board of Education meeting. This resolution would provide for an election to coincide with the Nov. 6 general election, at which voters in the Martinez, Alhambra and Vine Hill school districts would mark their ballots for or against unification choosing of five trustees at large and for or against a proposed $4.50 tax rate. If unification wins in November, the new unified district would officially come into being July 1, 1963. The Martinez area school district unification proposal scheduled for placement on the November general election ballot, will be shifted to January if the County Board of Education follows the recommendation made by District Attorney John F. Nejedly. If the proposal carries it will unify the Alhambra Union High School, Vine Hill and Martinez Elementary School districts. County Clerk Walter T. Pasach joined Nejedly in the recommendation. He noted that the number of state propositions and other issues on the November ballot have already made it unwieldy. The district attorney recalled that because of present law differences the counting of absentee ballots at the June primary complicated that election and that this would be repeated in November with the school measure on the general election ballot. A citizen's committee on unification of the Alhambra high, Martinez Elementary and Vine Hill Elementary School Districts will be organized at a meeting of the Alhambra and Martinez boards tonight in the library of the new high school administration and classroom building. The 7:30 p.m. session was set by Alhambra-Martinez trustees Tuesday night. A unification election is scheduled for January 8. Superintendent Thomas R. Turner pointed out that the Monday night meeting will be open to all interested citizens, whether they wish to participate in a fact-spreading campaign or merely want to be informed. Charles C. Laird, president of both the Alhambra and Martinez boards, appointed Attorney Joseph Filice as general chairman of the citizens' committee. Turner reported that Vine Hill residents will be on the citizens' committee on unification. During the next 2 weeks the Committee on School District Organization will hold meetings to provide information to the public concerning the proposal, which will be voted upon January 8, 1963. The last day for filing of declarations of candidacy for a seat on the five-member board which would direct the proposed Alhambra Unified School District if it is accepted at the polls is Friday Nov. 23 at the County Superintendent of Schools Office, 75 Santa Barbara Road, Pleasant Hill. Contenders are Clyde W. Melendy, Donald J. Bacher, Dr. B. Otis Cobb, Richard W. Benedict, Charles C. Laird and Fred W. Ernest. Melendy and Laird are members of both the Alhambra High and Martinez Elementary boards. Benedict is on the Vine Hill School District board. Dr. Cobb is a high school district trustee, and Ernest is a trustee of the Martinez Elementary district. Bacher, a businessman, holds no school office at present. To carry, unification must be approved by a majority of voters in both the Vine Hill and Martinez districts, both of which constitute the present high school districts. At the Jan. 8 election the voters will also designate their choices for trustees of the unified district and will vote on a proposed tax rate of $4.50 per $100 assessed valuation. The unified district would go into operation next July 1. Two incumbents on both the Alhambra and Martinez district boards did not file. They are Mrs. Phyllis B. Wainwright and Lester B. Small. Besides Benedict, members of the Vine Hill board are John Marin, president; Francis J. Digardi, clerk; Marion Strand and August Viale. Filing period for declarations of candidacy closed at 5 p.m. Friday at the office of County Superintendent of Schools Floyd I. Marchus in Pleasant Hill. Last to file was Ernest, who submitted his declaration Friday morning. Laird, president and clerk of both the Alhambra and Martinez boards, filed late Wednesday afternoon. First to file was Melendy, who was appointed by the County Board of Education Sept. 19 to the posts from which Henry A. Hartz had resigned. Dr. Cobb, pediatrician and a consultant to the county health department, lives on Alhambra Valley Road; Benedict on DeNormandie Way and Bacher on Estudillo Street. The proposal to unify the Martinez and Vine Hill Elementary Districts and Alhambra Union High School Districts into one district will be voted upon January 8, 1963. The school system has stated the three propositions which will be voted on and has made comment on the advantages of unification from the school's standpoint, and on taxes involved. "Shall a unified school district be formed to be comprised of the Alhambra Union High School District, with its component elementary school districts of Vine Hill School District and Martinez School District?" The State Board of Education, carrying out the intent of the Legislature, has stated that unified school districts provide a coordinated education program more efficiently for students from kindergarten through the twelfth grade. After an extended period of study and deliberation, the Contra Costa County Committee on School District organization has recommended that the Alhambra Unified School District be formed. Therefore, the County Superintendent of Schools has called an election for this purpose. 2. Additional state funds for a period of five years (approximately $8 per elementary student, $9 per high school student). "Shall the maximum tax rate for the proposed new district be Four and 50/100 Dollars ($4.50) per One Hundred Dollars ($100) of assessed valuation?" The separate tax increase proposal is necessary to operate the schools whether they are unified or not. The Alhambra Union High School and the Martinez School Districts had planned a tax increase election early in 1962. When it was apparent that unification would be voted upon it was decided to combine the two elections. The Vine Hill School District Governing Board has indicated that a tax increase election in that area would be necessary in the near future. "Election of Governing Board members. A further purpose of the special election is to elect from among the candidates the first members of the Governing Board of the proposed district if Proposition No. 1 carries by the necessary majority. Such Governing Board shall consist of five (5) members elected at large." The five members of the Governing board will be elected for two and four year terms and will assume their duties on January 28, 1963. The voters within the boundaries of the Alhambra Union High School District which comprises of the Alhambra Union High School, Martinez Elementary, and Vine Hill Elementary School Districts voted to join the three remaining Martinez districts into one remaining district, The Martinez Unified School District. 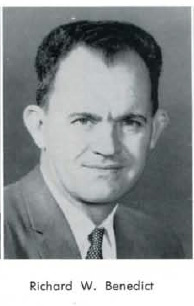 With the election of January 8, 1963 the Martinez Unified School District came into being on July 1, 1963. The Alhambra Union High School became Alhambra High School. The new Board of Education for the new unified school district was as follows: Donald Bacher; Richard Benedict; B. Otis Cobb M.D. ; Frederick W. Ernest; and Charles C. Laird. Unification brought about a common philosophy, equal financing, and a cohesive educational program for all of the students within the attendance boundaries of the high school. Charles C. Laird has been named chairman of the Board of Education of the Martinez Unified School District. Laird, presently chairman of the Martinez Public Schools’ two boards, will fill the office until July 1 when the term will expire. The new district received its name at the noontime session today when the new board met for the first time as an official body following the unification election Jan. 8. Richard Benedict, a member of the Vine Hill Elementary District Board of trustees and elected to the unified board, proposed the Martinez name rather than Alhambra Unified District to avoid confusion with other districts in the state bearing the name Alhambra. In a comment to a Gazette reporter today, Benedict said he felt the district should be recognized with the city in which it is most generally located. The new board agreed unanimously. B. Otis Cobb, MD, was elected temporary secretary until appointment of an executive officer for the district (superintendent) later this afternoon. That official is usually the secretary of the board. The meeting was held in the Administration Building of Martinez Public Schools and the new board will work on advance planning for the new district’s first year, which will begin July 1. Other members of the Board of Education are Donald Bacher and Fred Ernest. For the next five months the five members of the Board of Education of the Martinez Unified School District will be trustees without a district to govern. But because the unified district, approved by the voters Jan. 8, becomes official July 1, their deliberations and actions will be of vital import—and the activities of the existing Alhambra Union High, Martinez Elementary and Vine Hill Elementary Districts will be mainly of a windup nature. —Instructed Turner to obtain information from various organizations, agencies and individuals, including the county school office, on possible studies on (1) long- range master planning concerning district organization and (2) procdures and policies which will be needed by July 1. —Instructed Turner to contact Martinez City Manager James Emanual with the aim of negotiating a new agreement on the Martinez area recreation setup, currently operated under the Martinez Area Recreation Commission with joint participation by the city and the three present school districts. —Authorized the Alhambra-Martinez business office to make unified district purchases for the 1963-64 school year through the county purchasing office. This will be done after checking with the Vine Hill District. —Scheduled regular meetings for the second and fourth Monday nights of each month, at 7:30 o’clock, in the Alhambra-Martinez room at 921 Susana Street. Next meeting is set for Feb. 11. Turner stressed that the contemplated master planning on district organization is not with the idea of disruption or wide-spread shuffling of personnel but has the object of integrated and efficient development of the unified district, a process which may take several years. The members of the unified district board extended an invitation to all members of the other three boards to the unified board meetings and to participate in discussions. A major phase of the new board’s deliberations will be preparation of the 1963-64 budget for the unified district. Board Chairman Charles C. Laird asked Turner to report Feb. 11 on ideas for the educational program, including summer school, in-service training of teachers and 1963-64 classroom sizes. He also asked the superintendent to seek recommendations from the existing boards on personnel employment and curriculum for the coming year. Appointment of Turner and Delehenty followed a 40-minute executive session. As assistant superintendent, Delehenty will concentrate on administration of elementary schools in the unified district. He will continue as principal of Vine Hill School. 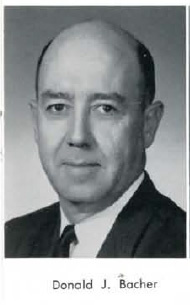 Prior to the naming of Turner as the unified district’s executive officer, who also serves as board secretary, Trustee B. Otis Cobb was temporary secretary for what undoubtedly was the shortest term of office on local record—about 50 minutes. 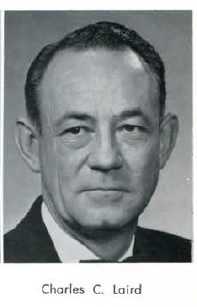 Dr. Cobb was elected temporary secretary immediately after Laird was elected chairman. Until July 1, when the three present districts bow out of the educational scene, Laird heads three boards – the unified, the Alhambra and the Martinez elementary. 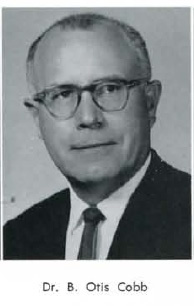 The meeting was called to order by Harold J. DeFraga, assistant county superintendent of schools, who reported that all board members had signed their oths of office and who pointed out that terms of Laird, Dr. Cobb, and Fred W. Ernest run through June 30, 1967, and that terms of Richard Benedict and Donald Bacher go through June 30,1965. The terms are in compliance with the Election Code, which specifies that the three highest vote-getters have four-year terms and that the two lowest have two-year terms. After marathon verbal dissection of the document’s summarization and its 10 major categories the Board of Education last night approved a $2,668,611 preliminary budget for the Martinez Unified School District. Presently estimated total tax rate for the first year of the new district, to start July 1, is $3,761 per $100 assessed valuation, according to Business Manager Thomas W. Long – but that “educated guess” is subject to change in the next few months as various pieces of the financial jigsaw puzzle fit into place. The budget, too, faces probable changes before the final 1963-64 version is adopted early in August for the district which, come July 1, is replacing the Alhambra High, Martinez Elementary and Vine Hill Elementary Districts. This probability was clearly indicated by trustees as they questioned Long and Superintendent Thomas R. Turner about many aspects of the budget. Explaining that “transfers are defined as interdistrict or interfund payments not chargeable as expenditures,” Long pointed out that this category includes the tuition payment made to other districts for the education of the physically handicapped (estimated at $2,000) and the local district’s contribution the food service program (estimated at $20,000). The contemplated $1.9-million-plus expenditure for instruction includes $1,678,071 for certificated salaries, of which $1,393,887 would be for regular daytime teachers; $90,152 for classified salaries; $10,003 for textbooks; $23,251 for other books, and $101,450 for a wide assortment of other expenses. In July 1963 a new system of excellence in education dawned in the beautiful little Martinez community. On the last day of June 1963 the three former districts in Martinez dissolved with the MUSD coming into operation on July 1, 1963. Everything went along smoothly and unanimously for two and three-quarter hours last night as Martinez Unified School District trustees approved many board rules, regulations and policies as well as numerous details concerning district personnel. Then friction developed over transiting theory into action to carry out an administration themselves, two months ago, time-table which the trustees themselves, two months ago, had asked a survey team to add to its recommendations. Result was that, after a 39-minute executive session, the Board of Education voted 3-2 to give the title of assistant superintendent in charge of business to Thomas W. Long, who has been business manager the past 17 years, and voted 4-1 to change Mrs. Mabel Bowen’s title from assistant curriculum coordinator to general elementary education consultant. Both title-changes are effective as of July 1 this year. Neither involves any change in salary ratio. Long will have some new responsibilities as assistant superintendent, but Mrs. Bowen, a 23-year employee of the local schools, has been fulfilling elementary education consultant duties the past two years, it was pointed out by Superintendent Thomas R. Turner. Board harmony returned with unanimous approval of another administrative time-table detail proposed by the survey team—creating the part-time positions of purchasing assistant and director of transportation. Although these positions—in effect one position—are on the district list as of now, they will not be filled until such time as there will be work to be performed in them. No new employees are being added to the as result of the title-changes and new positions, it was emphasized by Jr. James C. Stone, chairman of the survey team. In addition to Dr. Stone, who is the district’s administrative consultant, survey team members are H. Frank Bradford and Norman Kestner of the county superintendent of schools staff and Charles Arthur Briscoe, assistant superintendent-business manager of the Alameda Unified School District, Bradford and Kestner were present with Stone last night. Trustee Charles C. Laird voted against the title-changes for Long and Mrs.Bowen. Richard Benedict, of Vine Hill, joined Laird in voting against making Long assistant superintendent in charge of business, but he voted for naming Mrs. Bowen general elementary education consultant. “He hasn’t anything to do with it,” replied Laird, who stressed that his attitude was “not based on personalities” of district employees. Laird insisted that the matter should be discussed in executive session. About 20 minutes later, trustee Fred W. Ernest moved for tabling of a motion concerning the time-table, pending executive session. Nondebatable, the motion to table was promptly voted on and was carried unanimously. The trustees and Turner then went to the superintendent’s office for the closed-door session. A $2,781,750 budget for the current fiscal year with an estimated total tax rate of $3.382 per $100 assessed valuation was unanimously adopted last night by four members of the Governing Board of Martinez Unified School District. 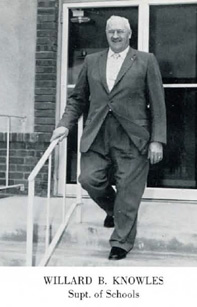 Dr. B. Otis Cobb, board president, was in Washington, DC in connection with President Kennedy’s physical fitness program for youth, in which he is a national director. 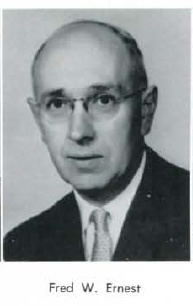 Charles C. Laird was chairman of last night’s meeting. Basic tax rate remain as previously contemplated—$3.48, the statutory maximum for general educational purposes, “overrides”, permitted by state law, come to 35.2 cents, a 7.1 increase from what had been anticipated earlier. Thus the new total tax rate—still subject to possible fluctuation when present “unknowns” are firmed up—is 7.1 cents more than the $3.761, which had been envisioned. Nearly 31 percent of the boost in “overrides” is the 2.2 cents added to the tax rate for a sprinkler system and other steps to make the old Alhambra High School administration building usable for instruction during a phasing out period pending tearing down of this 42-year-old structure. The new budget is $52,951 more than the $2,728,799, which was indicated in mid-July. Besides the sprinkler system and related details, additions in the “override” category are, certificated retirement, up from 10 cents to 10.6 cents; two new items—social security, 1.1 cents, and program for mentally retarded, 3.3 cents; debt service, up from 1.1 cents to 1.5 cents. Tax rate for classified retirement is down a half-cent, from 7 cents to 6.5 cents. Community services are still pegged at a 10-cent rate. Making the old high school building usable will mean that the six classrooms on the first floor will be used for possibly five years, according to Superintendent Thomas R. Turner. He pointed out that within five years the plans for second high school to be erected on the district’s 62-acre property in Vine Hill off Morello Road will be ready. The old building on the Martinez campus will then be torn down, and the ground on which it now stands will be transformed into a girls’ athletic field. With the phasing out plan in mind, board members — along with Turner, Thomas W. Long, assistant superintendent in charge of business, and John Stephens, director of maintenance and buildings and grounds took a quick on the spot look see, early in the evening, at the old structure which has been a landmark since it was opened in 1921. Laird and Trustees Richard W. Benedict and Donald Bacher participated in this inspection. The group then went to the board room on Susana Street for the regular meeting. Trustee Fred W. Ernest arrived there in time for the budget hearing. Estimated cost of making the old building usable is $8,000.00. Of this, about $3,000 would be for the sprinkler system, a like amount would be for plumbing and the remainder would be for carpentry. Questions on the sprinkler and plumbing phases are expected to be received in time for consideration at the board’s next meeting, Aug. 27. Carpentry work will at least in part, be done by district personnel. Turner stressed that this program will probably be about $60,000.00 cheaper for the taxpayers than would erection of a half dozen portable classrooms at cost of $10,000 to $12,000 per unit. Decision to go ahead on the “phasing out” use of the old Alhambra building followed conferences and exchange of letters with state fire officials. State Fire Marshal Glenn B. Vance had assured local school officials that his office would approve use of the first floor of the building if the following steps were taken. These conditions were listed by Vance and his senior deputy, John W. Frickes, in a letter that was picked up at Vance’s office in San Francisco yesterday. It was addressed to Long and was in response to a letter Long had written July 25 about the matter. Previously, a conference had been held by Turner, Long, and Martinez Fire Chief Clarence Viera and Deputy State Fire Marshal Sterling Shuster. During the budget discussion, Turner listed four factors which are still “unknowns” and which will affect the district’s income—the utility roll, still to be received from the State Board of Equalization; state apportionment; federal aid under Public Law 874; student enrollment in September. Turner, of course, did not imitate the famed actor-singer, but he did declare that in the next five years the district will need at least two additional elementary schools, a second junior high school and a second senior high school. He reported that David N. Delahanty, assistant superintendent in charge of elementary administration, is working with the teaching and administrative staff in preparing a ten-year projection of enrollments for the unified district, a summary of existing buildings and their capacities and a projection of building needs for all elementary, junior high and senior high schools. “We’ll project specifically for the next five years, on all three levels,” Turner stated. The three levels are elementary schools, junior high and senior high. In the studies the resources of county and city planning departments, the county schools office, the State Department of Education, public utilities, the county health department, school district architects, school staff and, in all probability, a citizens’ committee will be available, the superintendent pointed out. Martinez Junior High School 686, an increase of 55 over the 631 on September 4, 1962. Alhambra High School – 1,284, a boost of 84 over the 1200 of a year ago. 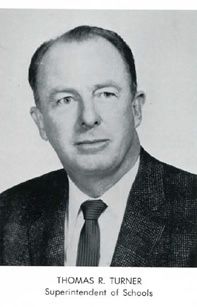 Describing the 248 overall increase for opening day as “remarkable” Turner predicted that the net increase for the entire 1963-64 school year, as compared to 1962-63, would be 125 or 150. September 4th the day after Labor Day--- just another day in Martinez for school students returning from summer vacation and swimming at the Rankin Park Pool. As I returned back to the Martinez Elementary School to start third grade I had no idea and there was no obvious signs that I was now a part of the future of education in Martinez. That it would be different from all those before the 1963-64 school year. I would not be a graduate in 1973 from the Alhambra Union High School but rather from Alhambra High School a part of the Martinez Unified School District. Fifty years of growth and change, but here we are 50 years later since the very wise people of Martinez, Vine Hill and all the citizens within the High School District voted to become one through unification. From 1963 to the present over 13,000 individuals have moved on to adulthood being educated and graduated by the Martinez Unified School District. Come July 1, 2013 will mark the fiftieth anniversary of the first day of official operation of the MUSD. Let’s make it a day to remember in community celebration. These stories have been researched from past issues of the Contra Costa Gazette and the Morning News-Gazette articles and personal research by David A. Rich. These and many other history stories can be found in the Alhambra Alumni Website located at http://www.AlhambraAlumni.org. We invite you to visit, join and learn more about Alhambra and the Martinez Schools colorful history.